Very nice 123. Curious about the current Premise user base here on Cocoontech? I have seen you writing about Premise now here for over 10 years. I am now over 60 here and tinkering keeps me going these days. I was starting to tinker with graphing using Node Red here with Homeseer and the author of the Mosquitto plugin added two created based on payload variables - rate and accumulation (payload numbers) and charting based on either payload or rate of payload or accumulation rate which moved the charting over to the mothership. Charting of payloads was already there and initially wanted to create a rate of payload function in Node Red. Only graphing right now is relating to the old Hobby Boards lightning sensor rate which is working fine. Ordered a couple of SonOff basic WiFi switches which I will be modifying to utilize with Mosquitto in the next few days with concurrent SSL testing. This will be modifying the SonOff hardware with new firmware and doing a hands on to the SonOff board. These used to be around $5 each and now noticed that they are around $7 each. Still a reasonable price for a remote controlled automation device. I figure there are only a handful of active Premise users left ... and I believe they're all here. The software just works, can still be extended to incorporate new things, so I continue to use it. If you're going to flash the Sonoff devices with new firmware, have a look at this blog post where the author compares three popular firmware replacements: Tasmota, ESPEasy, and ESPurna. It's the first of four articles and it highlights the principal differences between the competing choices. Well worth the read and useful for choosing the one that's bet for your needs. Edited by 123, 25 May 2018 - 08:12 PM. Last week purchased a couple of the SonOff basic WiFi modules and flashed one OTA style last night with a Tasmota firmware. Still in tinkering mode learning baby steps style. Historically and today still mostly in analog wired mode for my automation. I am way behind compared to what you are doing 123 today with Premise. Did my first hardware modifications today to a Sonoff Basic WiFi device turning it in to a low voltage sensor and switch from a high voltage lamp switch and changing the firmware to Tasmota. It involved cutting the high voltage to relay traces on the Sonoff board, a bit of soldering and installation of some header pins (for JTAG and GPIO access). This will be the first device that I control using Mosquitto. It is a bit similar to my tinkering with micro travel routers and RPis, using new firmware, exposed GPIO ports and a bit of bit banging over the last few years. I've enhanced SyseventBroker so that it can export Premise Home devices into OpenHAB format. What's the advantage? I can now use OpenHAB's user-interface(s) to control Premise objects. OpenHAB offers "BasicUI", which is rendered in a browser and in OpenHAB's iOS/Android apps, and "HABPanel" which is also rendered in a browser and targeted for touchscreen devices. Dimmer is the item's type. Home_FirstFloor_Kitchen_CeilingLight is its name for programming purposes. Ceiling Light is its display name in a user-interface. light is its icon for a user-interface. Dimmers, Kitchen are groups this item belongs to. Lighting identifies this item for use with Alexa, Google Assistant, and HomeKit. mqtt is the binding (aka device driver) that allows the item to talk to the actual kitchen light. Anyway, SyseventBroker takes care of performing the conversion. It also creates location-based Groups that reflect all the buildings, floors, and rooms in your Premise Home as wells as a few function-based Groups like Sensors, Lights, Security and their sub-groups like SecuritySensors, TemperatureSensors, Dimmers, NonDimmers, etc. This diagram shows how objects in a Premise Home are converted to OpenHAB Items. So far, I've created one UI using BasicUI and another, much simpler one, using HABPanel. A BasicUI is defined using a text file called a Sitemap. For HABpanel, you define it within the browser; just drag widgets around and define their purpose (super easy). Premise on a PC <===> MQTT Broker on a Raspberry Pi <===> OpenHAB on the same Raspberry Pi. Rather than show you my own meagre efforts, I'll direct you to the impressive work done by others. Here are examples of BasicUI. Here is a video demonstrating a HABpanel UI. The first half-minute shows the UI in action (albeit somewhat out of focus). Jump ahead to 1:40 to see how simple it is to add widgets and design the UI. Here are examples of HABPanel. My next step is to leverage MyOpenHAB.org. It's a free cloud service that allows you to securely access OpenHAB remotely. The phone app detects it is not on your local network so it logs into MyOpenHAB.org (using an account you create) and accesses your OpenHAB machine at home. I believe you can optionally constrain which devices are remotely accessible. Edited by 123, 10 August 2018 - 08:52 AM. So far only @etc6849 has been actively using SyseventBroker. Over the summer we worked together, offline, to refine SyseventBroker. I didn't get much feedback in this forum so I skipped posting updates about the latest greatest version of SyseventBroker. But since you asked, I've attached the latest version of SyseventBroker and its important companion, namely the Premise-MQTT flow for Node-Red. Both are needed to make Premise fluent in MQTT. FWIW, I have an RPi running OpenHAB with a Mosquitto MQTT Broker. To install the broker, I used openhabian-config and select the option to install the MQTT broker. Basically, you control the light using its command topic and receive its status via the state topic. SyseventBroker has an Export function that can export most of your Premise home objects into an openHAB Items file. This save you the hassle of manually transcribing all of your Premise objects into openHAB format. Here's some documentation to help gain a better understanding of what SyseventBroker does, what's needed to make the magic happen, and how to install everything. SyseventBroker is a Module that provides Premise with the ability to communicate via MQTT. 1. SyseventBroker listens for sysevents occurring on supported devices (currently all standard Home devices, except MediaZone and Keypads). 2. The sysevent is converted into a JSON string. 3. The JSON string is sent, via TCP, to Node-Red. 4. A Node-Red flow converts JSON into MQTT format and publishes it to an MQTT Broker (state topic). Information can travel in the opposite direction as well. 1. 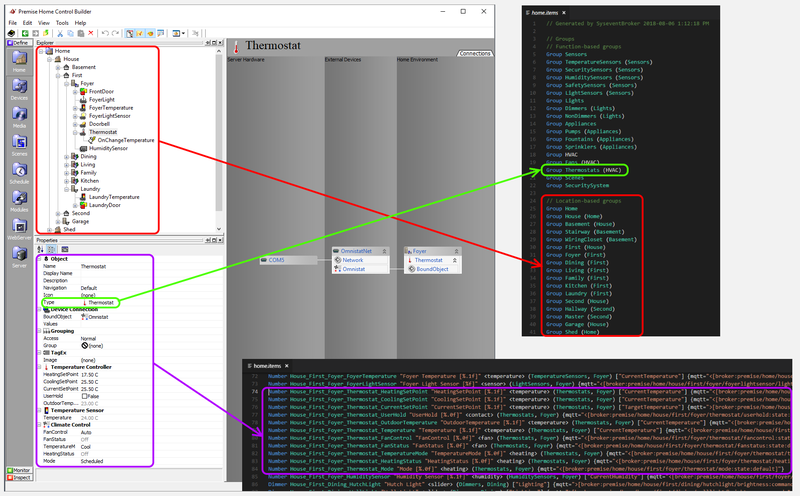 The Node-Red flow is subscribed to all Premise-related MQTT topics (i.e. it listens for MQTT messages intended for Premise). 2. It converts a received MQTT message (command topic), from the MQTT Broker, into a simpler format and sends it, via TCP, to SyseventBroker. 3. SyseventBroker validates the received information and uses it to control Home devices (dim a light, adjust thermostat setpoint, arm security system, etc). SyseventBroker transforms a device&amp;amp;rsquo;s path and property into an MQTT topic. Here are examples of how Premise properties appear as MQTT topics. Notice all characters are lower-case and there's no leading slash. SyseventBroker can convert all outbound messages according to one's preferred Units of Measurement. For example, Premise can convert all outbound temperature values into Celsius (for use in MQTT) and convert inbound values back to Fahrenheit. It also validates all incoming values. If it receives an invalid value, it rejects it, and then sends the current, correct value back to MQTT. For example, to turn a light on/off, the valid values are 1 and 0, respectively. If SyseventBroker receives any other value, it ignores it and sends the light's current value. SyseventBroker offers a Heartbeat function to monitor its connection with Node-Red. It sends a heartbeat message to Node-Red which replies with an acknowledgement. If there is no reply by the third heartbeat, SyseventBroker enables its Communication Failure property and logs a Premise Event. Upon initial configuration, it is recommended to send the status of all devices to the MQTT Broker. The message&amp;amp;rsquo;s payload (value) is configured to be retained by the Broker. Now the Broker knows the status of every Premise device. When an MQTT client connects to the Broker and subscribes to Premise-related topics, it will immediately receive the status of all Premise devices. Installation involves importing the Premise-MQTT flow into Node-Red and configuring it to connect to your MQTT Broker. In Premise, a Lantronix UDS10 is created to provide TCP communication with Node-Red. Lastly, the SyseventBroker Module is imported into Premise and configured. MQTT communications require an MQTT Broker. Eclipse's Mosquitto is a free, open-source version available for Linux, Windows, and OSX (www.mosquitto.org). It is described as the "Visual wiring tool for the Internet of Things" and serves as the middle-man between Premise and MQTT. Node-Red is available for Linux, Windows, and OSX (www.nodered.org). HOW TO IMPORT THE PREMISE-MQTT FLOW INTO NODE-RED. 1. Open the Premise-MQTT file in a text editor. Select and copy all content. 2. Switch to the Node-Red editor. 3. If needed, click the "+" tab to create a new flow (empty canvas; no nodes). 4. Click (Hamburger) Menu > Import > Clipboard. 5. Paste into popup window and click Import. 6. Click on the canvas to anchor the flow. HOW TO CONFIGURE THE FLOW'S MQTT CONNECTION. 1. Double-click the MQTT node (upper right in flow). a. Enter Name to identify the node (such as the host name of your MQTT Broker). b. Enter Server. This is the MQTT Broker's host name or IP address. c. Enter Client ID. Choose a unique name to identify the MQTT session. a. Enter Username (if your MQTT Broker requires authentication otherwise leave fields blank). 5. Click Update, then click Done. 6. Click Deploy to commit all the changes. The MQTT node should indicate "connected". If not, double-check all information you entered. If the MQTT node connected, the flow is now operational and awaiting a TCP connection on port 5100 (default). Most of the flow's Debug nodes are disabled. They can be enabled to examine how messages are processed. Use Windows Firewall to confirm Premise Server has access to Private Network. SyseventBroker will use TCP port 5100. 1. Ensure the Lantronix driver is installed. 2. Create a New > UDS10. 3. Set its Name to SyseventBroker (for convenience; it can be any name you wish). 4. Set IPAddress to the address of the machine hosting the MQTT Broker. 5. Set IPPort to 5100. 7. Create Devices > CustomDevices > New > SyseventBroker. Double-click Port, select Devices > Lantronix > SyseventBroker. Scroll to UnitsOfMeasurement and indicate your preferred units for communicating with MQTT. Click SendStatus to transmit the current status of all devices to MQTT. The default Heartbeat interval is 30 seconds. If you wish to change it, navigate to Modules > SyseventBroker > Broker > Timers > HeartbeatTimer. Generates a list (in Debugview) of all Home devices containing a DeviceStatus method. These are devices that are (ostensibly) supported by SyseventBroker. All Lighting, Appliance, HVAC, Security, Safety, and Scene objects are supported. Generates a list (in Debugview) of all Home devices that do not contain a DeviceStatus method. These are devices that are (ostensibly) not supported by SyseventBroker. MediaZone and Keypad objects are (currently) not supported nor are any custom devices. There's one more thing you'll need for openHAB and that's Transforms. Premise sends 1 and 0 for True and False but openHAB wants to see ON and OFF (for a Swtich). So in openHAB's Paper UI, go to Add-Ons > Transformations and install MAP-Transformation (it makes the service available to openHAB). Then you create a file in the transforms folder containing the conversion from 1 to On and 0 to OFF. You'll need another transformation file to convert in the other direction from OFF to 0 and ON to 1. To spare you this hassle, I've attached all the transformation files I've created. Edited by 123, 14 November 2018 - 01:04 PM. wow! Thanks for the extremely comprehensive overview. I'll be attempting it this weekend. Thanks so much. I finally downloaded this - not sure if I missed the files or what, but after rereading this a dozen times, I think I can spend some time trying to make it work in my environment.